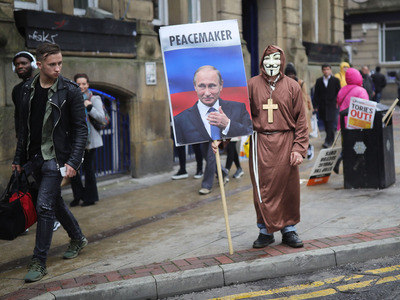 Christopher Furlong/Getty ImagesAn anti-Brexit protester at the Conservative party conference. Researchers have uncovered networks of Russian Twitter accounts which posted messages in the run-up to the UK’s EU referendum vote. Academics at Swansea University and Berkeley uncovered 150,000 accounts and 45,000 messages around Brexit. One of the most prolific Russia-linked accounts spread messages of Islamophobia, xenophobia, and negative messages around Sharia law. Analysis of the research showed humans were susceptible to the bots, and retweeted messages created by Russia-linked accounts. Prime minister Theresa May accused Russia of trying to “sow discord” through misinformation. If you follow @sveta1972q1 on Twitter, you’ll see lots of seemingly harmless tweets about cloud computing dating from August 2016. @sveta1972q1 was identified by researchers at Swansea University and Berkeley, California as being a possible Russian bot operating on Twitter during Brexit and the US presidential election. Their wider research found 150,000 Russian-linked accounts and 45,000 messages sent on Twitter during Brexit. 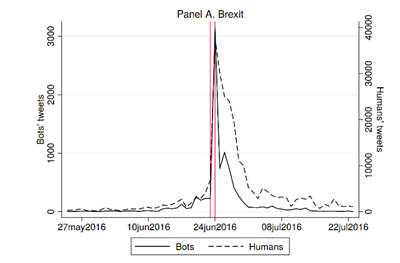 The researchers collated data by collecting 28.6 million tweets tagged with the #Brexit hashtag between 24 May 2016 and 17 August 2016. 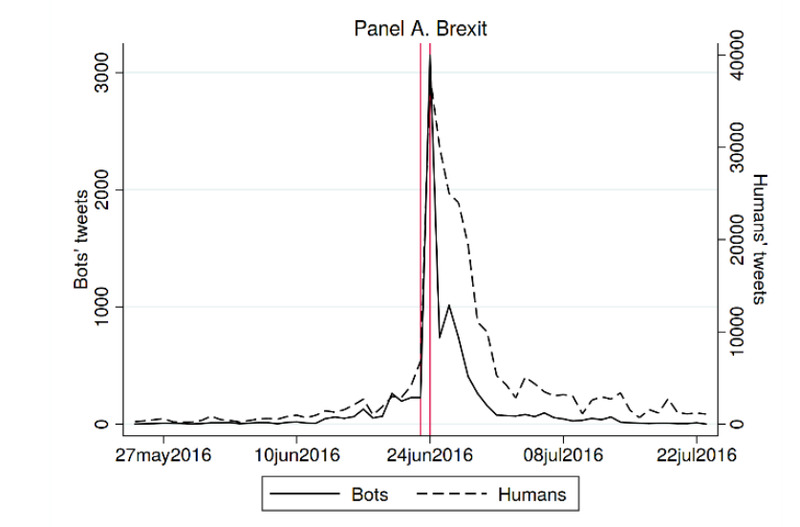 The idea was to examine social media sentiment around major political events, so not all were bots. But they identified thousands of Russian bot accounts through the fact the accounts set their language description to Russian, not English. And their habit of posting hundreds of tweets in a day suggested they were bots. Tho Pham, PhD candidate at Swansea University, identified @sveta1972q1 as “one of the most active accounts” in an email to Business Insider. The account remains active, but is labelled by Twitter as “temporarily restricted” due to unusual activity. Tho PhamThis Twitter account was identified by researchers as a possible Russian bot. Here’s another sample tweet, provided by Pham: “these are not peaceful refugees they are violent invaders #calais.” The tweet was sent on 22 June 2016 — one day before the EU referendum vote. There had also been a story from The Daily Express that refugees in the Calais “Jungle” camp had attempted to jump onto a lorry and cross the border from France into the UK. Business Insider saw only a sample of @sveta1972q1’s tweets between June 20 and June 24 — the immediate run-up and aftermath to Brexit. The account sent 99 tweets in that time. This effectively amounts to a tweet on the hour, every hour over four days — not impossible, but highly improbable taking into account factors like sleep. Business Insider asked @sveta1972q1 whether they were a real person, but whoever is behind the account did not respond. What is harder to determine is what impact the tweets had in terms of specific numbers. 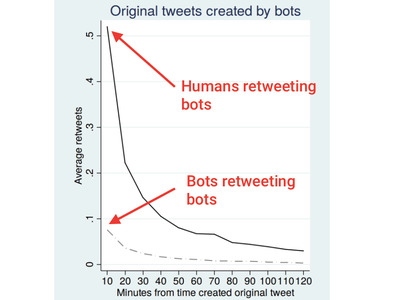 But the researchers generally found that human accounts were susceptible to retweeting messages created by bots. 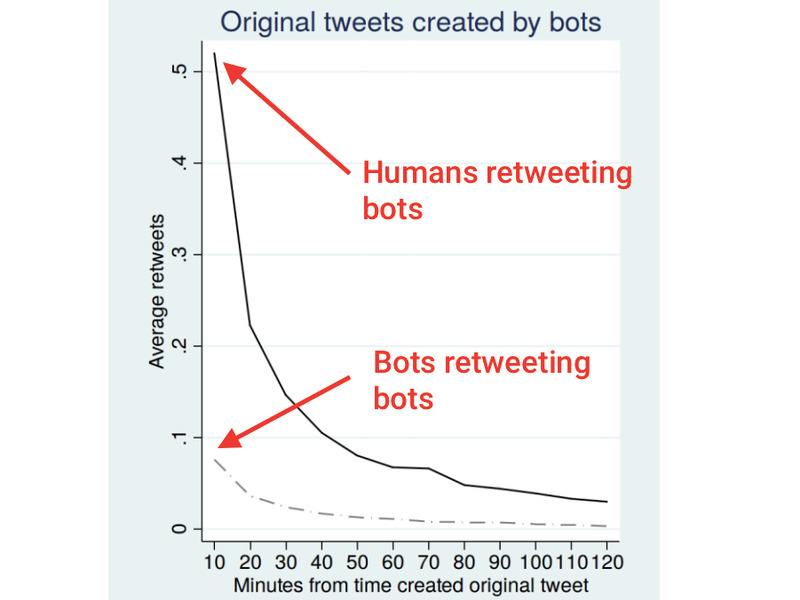 On average, an original bot tweet got five retweets from humans. According to the researchers, most of the Russian-linked accounts appeared before the Brexit vote. “For the Referendum, the massive number of Russian-related tweets were only created few days before the voting day, reached its peak during the voting and result days then dropped immediately afterwards,” they wrote. Pham told Business Insider that many of the accounts had now been suspended though some, like @sveta1972q1, appear to have slipped through the net and are now tweeting about other topics. She added that she had actually expected more bots around the time of the vote. Sources close to Twitter pointed out the firm has done considerable work in filtering out “low-quality” accounts and tweets. Just because the tweets are on the platform doesn’t mean the bulk of users actually see them.